It is said if you are good enough, you are old enough. 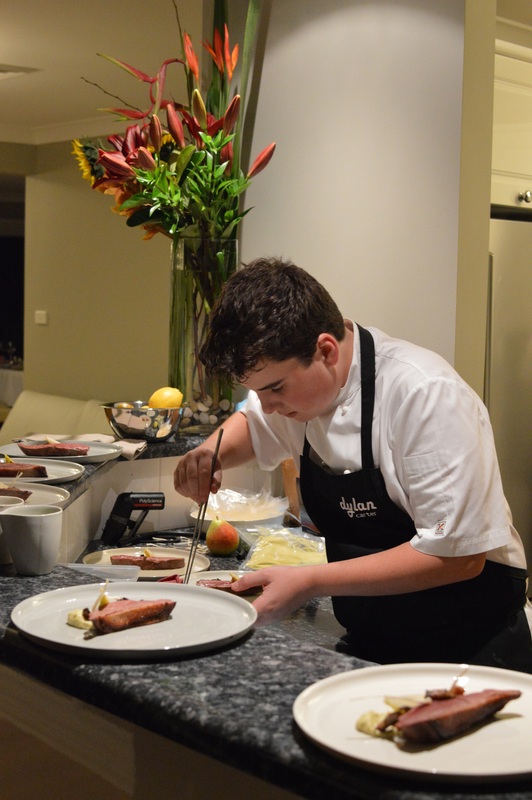 The success of young Chef Dylan Carter’s first pop-up restaurant certainly adds credence to that expression. 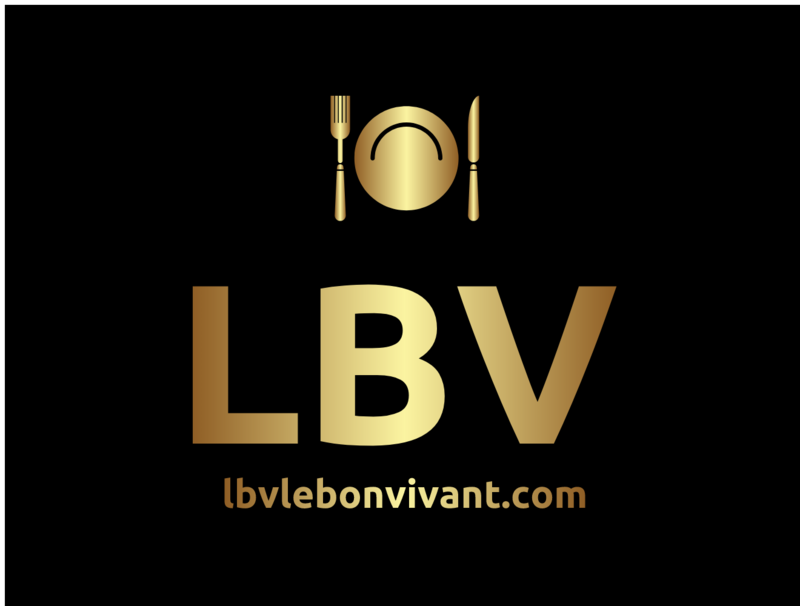 Only just having turned fourteen, he has already staged at Ormeggio, Flying Fish, Biota Dining, Becasse, Pier, Assiette, Cutler and co, Vue de monde, Jacques Reymond, Attica, and Four in Hand. Clearly, his rare talent has been both recognised and nurtured by key figures within the Industry, and all things being equal, his future looks immensely promising. I have always maintained that an understanding of balance of flavours is a very intuitive skill, and there is no doubt that this gift underpins the quality of his food, even at this formative stage. A six course menu, with two preliminary snacks served in a stunning beach side house in Wombarra, was the perfect venue to host such an event. I should note for context purposes, all the food was prepared in a domestic kitchen environment, which makes the achievement all the more impressive. Apart from a specialised water bath, smoking device, and a dehydrator, the rest of the appliances were absolutely stock standard. When you also consider the food background of the group invited, it was an ambitious first pop-up for this talented young Chef, who could have picked an easier mark. 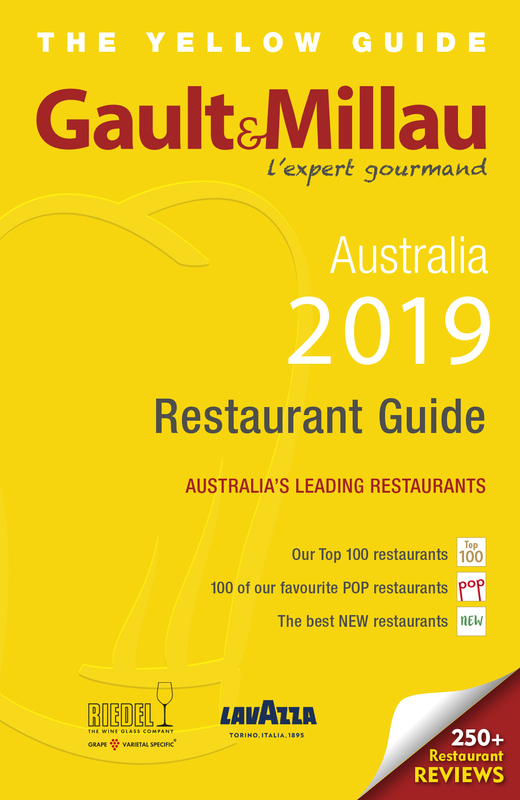 However, after speaking to Chef Grant Croft from Biota Dining (who has worked closely with Dylan), this choice parallels that of his work ethic. Methodical preparation and planning is evidenced by his working journal which is quite breathtaking in the level of detail that is contains. Broken into seasons, it is potentially the “preliminary spine of a cookbook”, as one diner commented. Artisanal bread and cultured butter is the first marker that a duty of care is in place. It may seem like a small detail, but it forms part of the composite experience. The first course, modestly listed as a snack, was a lightly seared sea scallop served in the shell, with a subtle jamon-infused dashi, that was steeped overnight. The dish demonstrated thought, nuance, and technique; and was the ideal way to start. 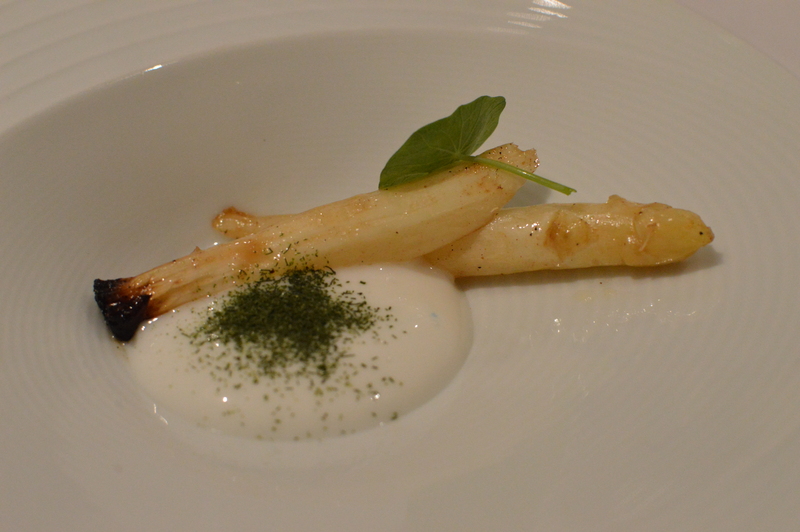 The next, two white asparagus stalks cooked upright, was served with goat’s milk foam and finely cut fennel garnish. Those of you who follow this blog know my thoughts on the questionable relevance of foams, but I had no such misgivings with this one. The foam had lovely consistency and balance that most importantly added a nice point of contrast. 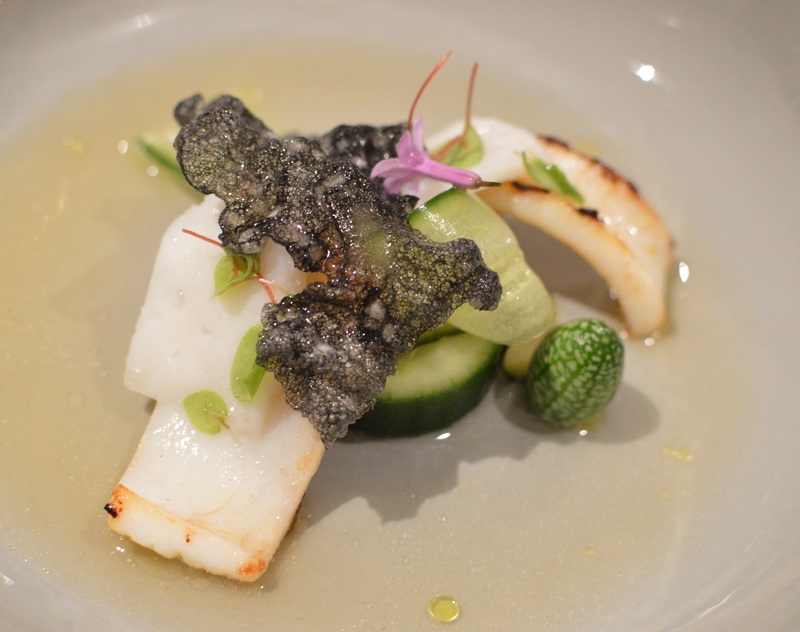 The divine iki jime Tasmanian squid was done to the perfect texture, with pickled and fresh cucumber adding some acidity, and macadamia adding some crunch. Red veined and sheep sorrel, beach mustard, society garlic flowers, and a striking squid ink tapioca puff, complete a very noteworthy dish. 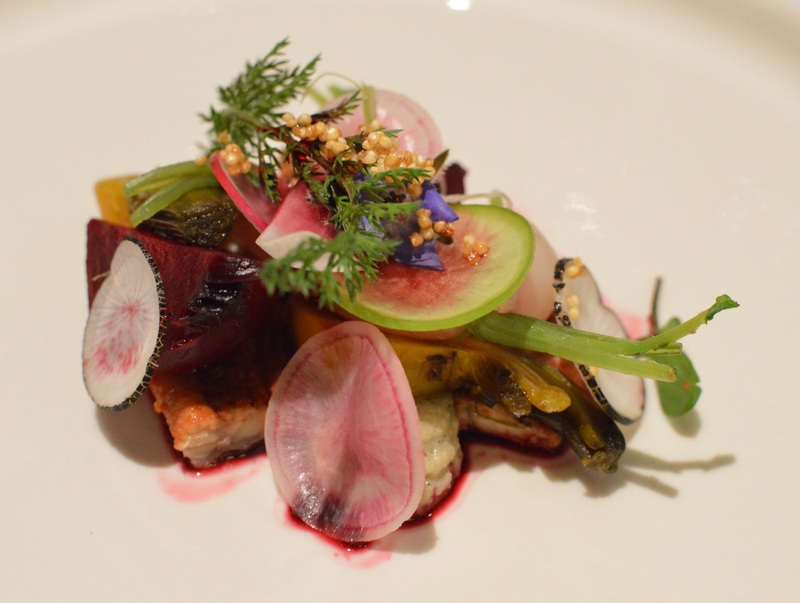 Next a visually stunning dish of smoked eel, beetroot, quinoa and yarrow leaf garnish that adds an aniseed aspect which contrasts the earthy and smoky elements of the dish. It is a thoughtful and accomplished dish that would not be out of place in any ‘hatted’ restaurant. 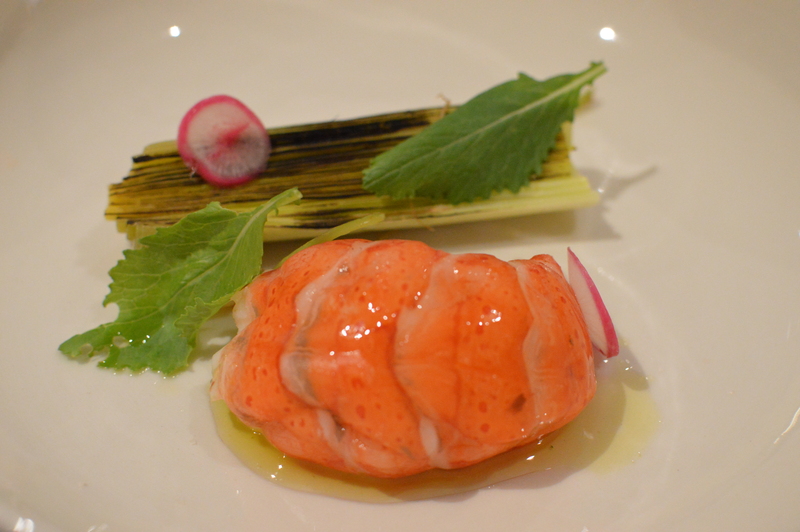 The textbook execution of the sublime poached West Australian marron is acknowledged by all, especially the experienced Chefs present at the table who know exactly how much skill is required to hit that mark. However, it is the fermented and charred leek that really evokes a discussion point in just how well it both balanced and elevated the dish, demonstrating maturity and judgment beyond his years. The Milly Hill Lamb, whose produce incidentally just keeps getting better, is cooked sous-vide then flashed in a pan to caramelise and finish. 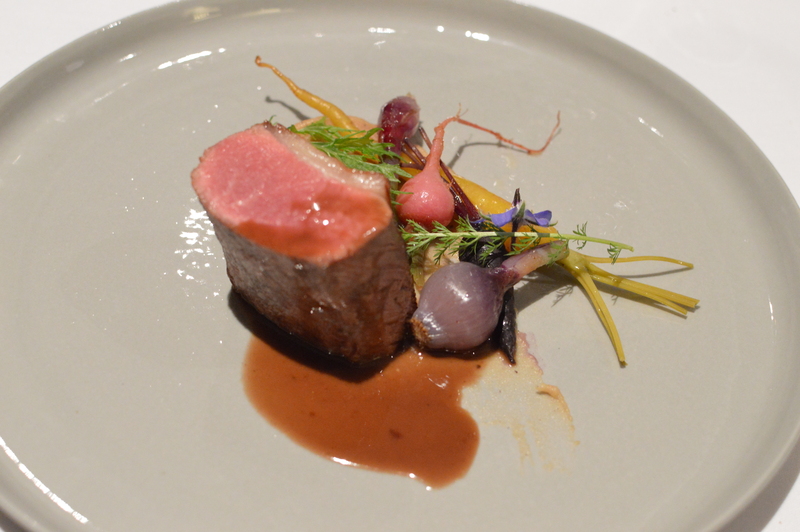 It is served with a lamb bone and red wine reduction, including a black garlic puree “knocked up on the fly” which brings the dish together. Similarly, the Jum Jum Farm Muscovy duck is prepared identically, but is accompanied by a pear and watercress juice. We conclude with autumn berries, a vibrant ode to the season which incorporates impeccably sourced produce, through a thoughtful play of contrasting textures and techniques. 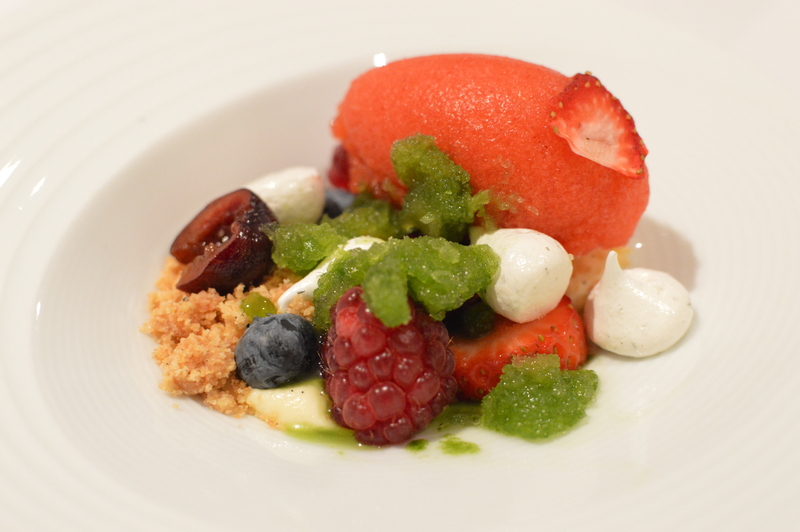 The strawberries, both fresh and dehydrated are spectacular, and the sorbet hits just the right mark. On reflection, there was only a couple of minor timing and seasoning issues. However, considering this pop-up was bravely untaken in a domestic environment; and Dylan’s palate is still evolving, albeit at an astonishing rate, overall it was a totally stunning debut by a young man whose career we should all keep a very close eye on as it unfolds. What strikes me is his ability to conceptualise the impact of flavours, and present them on a plate harmoniously. Maintaining perspective so incredibly early in a Chef’s career is important, especially when they have only just turned fourteen. However, it would be remiss not to acknowledge and highlight a rising talent where the sky is literally the limit. Given ongoing access to the right mentors, placement and encouragement, it is not premature to say that Dylan Carter will make a significant impact in this industry if he continues to develop at this astonishing rate. To already understand the importance that layering of textures and balance of flavour brings to a dish at his age is gobsmacking. When I asked Dylan his aspirations, he simply relied, “I want to open a nice restaurant that people enjoy going to”. That refreshing simplicity of that sounds pretty good to me. Cheers. Yes, http://www.thetruffleman.com.au provided the matched wines which were very decent, and I must say well matched. Congratulations Dylan, It is so wonderful to see that you are creating such wonderful food. It is a pleasure to be able to follow your culinary journey. Thanks so much for leaving your comments, but more importantly encouraging young Dylan to follow his dreams, as he is in my opinion a very rare talent.